No one knows exactly when or where cheese was invented although it can be said for certain that it was not in Switzerland. One story has it that a merchant traveling through the desert 5000 years ago made the discovery by accident when the milk he was transporting in a bag made of a sheep's stomach reacted with the natural rennet in the stomach lining and was churned into cheese by constant jogging. Be that as it may, cheese is certainly mentioned in the Old Testament in texts which may date back 3,500 years. Swiss cheese was mentioned by the first century Roman historian Pliny the Elder, who called it Caseus Helvetius, the "cheese of the Helvetians", one of the tribes living in Switzerland at the time. For centuries the standard type was cottage cheese, made by souring milk, and which did not keep. The technique of using rennet a substance taken from the stomach lining of calves to make hard cheese first appeared in Switzerland around the 15th century. Since such cheese could be stored for lengthy periods it is not surprising that it soon became part of the basic fare of travelers. The monks who looked after the hospices at the top of some of the major passes, snowed in for part of the year, kept large stocks of it for their guests. And they needed to be large, one guest who passed through the hostel on the Great St Bernard pass was Napoleon, who with the help of his 40,000 troops got through a tonne and a half of the monks' cheese in May 1800. The monks had to wait 50 years before they saw any money at all for it, and it was only in 1984 that the then French President, François Mitterrand, made a token payment of the rest. Once it could be stored, Swiss cheese soon became a valuable trading commodity. By the 18th century it was being sold all over Europe even to the detriment of the local market, if a 1793 travel guide is to be believed. It is rather strange that cheese and butter should be so bad in inns throughout Switzerland. Even in the regions which produce a lot of milk, it is hard to get good cream for your coffee or fresh butter, because the locals find it more profitable to make cheese out of their milk. Switzerland soon exported not only cheese but cheesemakers too. Many of the thousands of Swiss emigrants who settled in the US in the 19th century were dairymen, some of whose descendents are still making cheese there today. Others were invited to Russia and eastern Europe to help set up a dairy industry. Some of them remained in those countries, but many eventually came back to Switzerland. It was Swiss cheesemakers who developed Tilsiter cheese, named after the town of Tilsit, which was then in East Prussia, and is now the Russian town of Sovetsk. They brought their new product back with them when they returned home. Even today, the Swiss government provides advice and practical help in cheesemaking as part of its aid to developing countries. Not quite such a success story as far as the Swiss were concerned was the accidental cession of valuable pasture land to Italy in 1821. A notary in Brig sold the Bettelmatt Alp, on the border between Switzerland and the Piemont, to an Italian, without realising that it would thereby change country. The pasture, sufficient for about 100 cows, is renowned for its juicy grass and aromatic herbs. But the creamy cheese it produces is now an Italian, not a Swiss, variety. In a skillet, heat olive oil over medium heat. Add sausage to skillet, about 7 to 8 minutes, turning once. Remove sausage from skillet and keep warm. Add onions, bell peppers, salt, pepper and oregano, stir, cook until tender. 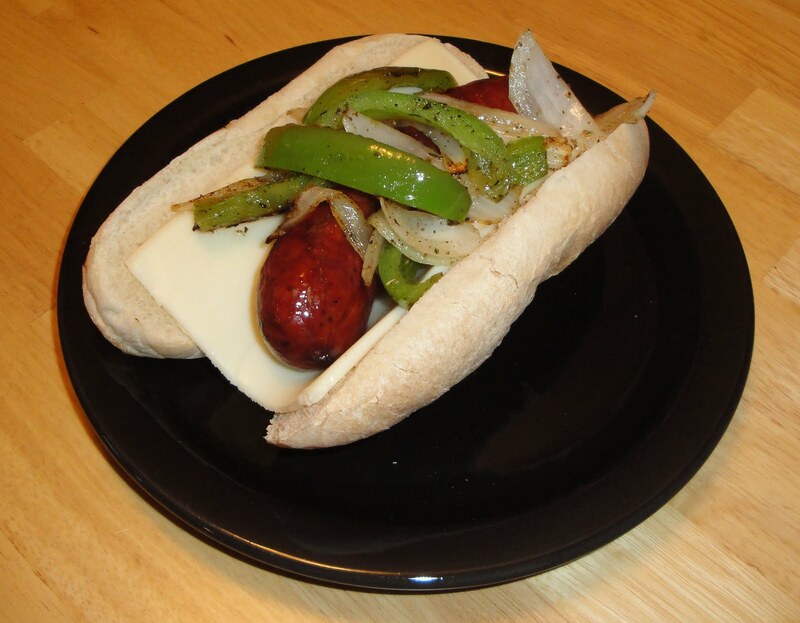 Add cheese to buns, then add sausage, top with onions and bell peppers. Enjoy! Looks great Christine. When I go to the fair, one thing I always have to get is a sausage sandwich. Sooooo yummy! That looks so good! I love the combo of sausage and peppers! Love sausage and peppers. That combo never gets old. I love sausage and peppers...but what a great story on how cheese was first made! This sandwich looks delicious Christine!! Love sausage and pepper sandwiches! I don't think I've ever had pecan sausage actually! This sounds like a totally awesome combination. And I love the idea of a smoked pecan sausage...I'll be keeping my eyes peeled. I'm the same way, when I go to the fair, I have to buy a sausage sandwich too. I also like the turkey legs at the fair. You can find smoked pecan sausage at Walmart. Christine this looks amazing. I love sausage. So yummy! Thanks for the little cheese history. I've honestly never thought about where it came from but that's a wonderful story. The sandwich looks hearty and delicious! This makes me think of Octoberfest. Nothing like a good sausage & pepper sandwich! Have a great weekend. I appreciated your little cheese story. It would have been nice to hear from other countries too who are well known for their cheese (switzerland is not the only 1). This looks great!! Sausage and peppers are always a winning combo! I love this idea, and who wouldn't love this..i mean sausage,and peppers in a bun..yum!!! This would be wonderful for a quick lunch! Love the idea! What a great sandwich....sausage and peppers are always so amazing together. Keeping my eye out for the pecan flavor. You can buy smoked pecan sausage at Walmart. Nice and simple Christine, gave me ideas on what to prepare on a lazy day where I need to push myself to cook something for my hubby who appreciate me cooking for him. Wow, thanks for enlightening me about how cheese comes about, truly interesting. ;) love your blog! Wow! I had no idea - what an interesting history. Exporting cheesemakers, eh? Awesome. De-Lish!! I'm not even a fan of sausage and I would try this. I haven't heard of pecan sausage but I'm going to look for it. Yum! I always welcome a great sausage and peppers dish, or on a bun... Great stuff!